No tools are needed other than a pair of scissors, although a dubbing needle or fly tying bodkin will help in tying the knots and applying the flexible cement that keeps the knots secure. You don't need a jig like you would to furl lines. You don't need a vise like you would to tie flies. All you need is the horsehair that is included in the kit and the instruction sheet that explains, step by step, how to make your line (with photos illustrating each step). I have also included a short piece of 2X tippet material for a line to tippet connection and a short piece of braided fly line backing for the line to rod connection. A bottle of flexible cement, like Dave's Fleximent or Rumpf Flex Cement, or a tube of Loon UV Knot Sense will make the knots more secure but is not absolutely necessary. I rarely use it anymore, and have not had any of the knots come undone. There is enough hair, 2X tippet and fly line backing included in the kit to make several lines. How many you can make depends to a large extent on the length and taper chosen for the lines you make and the number of hairs you break in the process. You must break some, because each hair is briefly tested for strength before being used. If you do a thorough search on the internet, you can find a number of ways to make a horsehair line, from the instructions laid out by Dame Juliana Berners in The Treatyse of Fysshynge wyth an Angle in 1496 on down. None of them are as simple and straightforward as the method used with this kit, and none include photos of each step. Some of the instructions you can find on the internet are for making a knotless line. It is absolutely not necessary to have a knotless line. To the extent possible, a tenkara line should be in the air, not in the water, so picking up debris on the knots really isn't a problem. If anything, the knots are valuable reference points that aid you in watching for the minor hesitations or twitches that can be the only clue to a subtle strike. 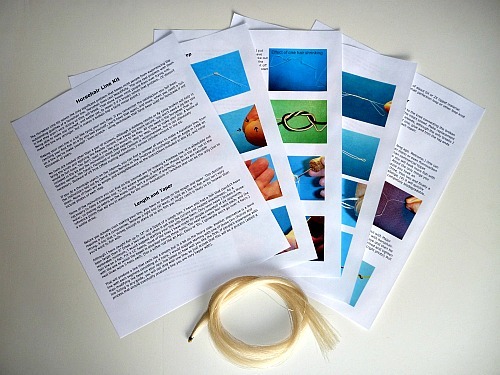 The instructions also cover using horsehair tippets, which will return the challenge to catching even modest fish. 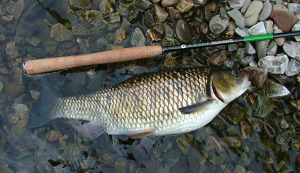 Tenkara rods protect light tippets very well, though, so horsehair tippets are not unreasonable (all right, not completely unreasonable). I wanted to say thank you for a fantastic job with the horsehair line kit! I've had my own experiences with making furled mono, fluoro, and kevlar lines before, and I can tell you that after using your instructions, I'll never go back to my furling jigs. Well done! From start to finish my first line could not have taken more than twenty minutes, and the quality of the horse hair was top notch. Thank you for putting together such a well thought-out product. I recieved my horse hair kit 2 weeks ago. I made my first line and it was so easy. I found it a little light however. I made my next one a bit heavier. 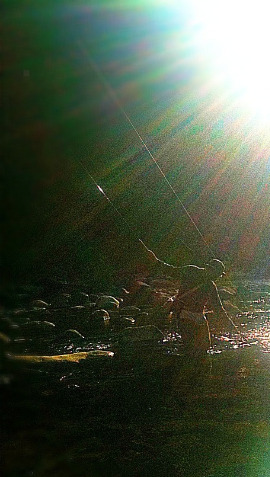 Casts and turns over great and lays the fly on the water with hardly a ripple. 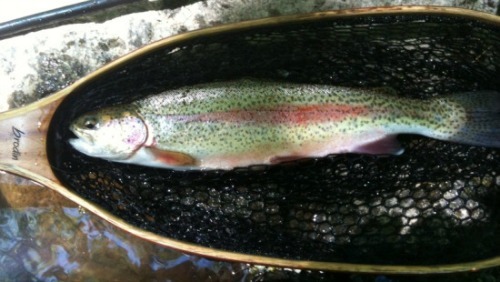 Hooked a fat 15" today who jumped 6 times, and landed him without a net. Love it and just wanted to say thanks. I see no reason to fish anything but my own horse hair lines. I bought a horsehair line kit from you, and it worked amazingly well. I ended up making a few different lines, one with only a single hair at the tip (instead of a tippet or anything else), and it was amazing the size of fish you could pull in if you let the flex of the rod take the beating. After receiving the Kurenai HM33R on Thurs, I spent that afternoon and Fri. casting in my yard like I always do, different lines and lengths. I settled on a 8-9' pc of #3 fc and an 8' horsehair line of 3x5,2x4,1x3 [3' of 5 hairs, 2' of 4 hairs and 1' of 3 hairs] with a short #3 fc extender. These lines and lengths are going to be my penultimate small stream killers.